One colour that is always associated with fall is burgundy and year after year I seem to love it even more. It is one those colour that doesn't get old and you know that for many winters ahead, it is the one you can trust to return stronger than ever. This season, red tones have marked a strong presence in fashion, dominating autumn/winter 2017 shows with brands such as Givenchy, Max Mara and Gucci sending down the runways wine, red and all-burgundy looks. I love a bit of blood or cherry red for fall, but if the thought of wearing these rather bright shades is a little too much, not only is burgundy a universally flattering shade, it is super versatile and easy to pair with other colours as it goes well with black, grey and white. And if you're into the burgundy colour like me, do it head-to-toe too! When I saw this jumper I fell in love with it, not only it was in a colour I loved, the sleeves were absolutely fabulous and just added to the whole look. I wore it for the first time this past weekend and got so many compliments on it as people were rather surprised to find out it was from Primark. 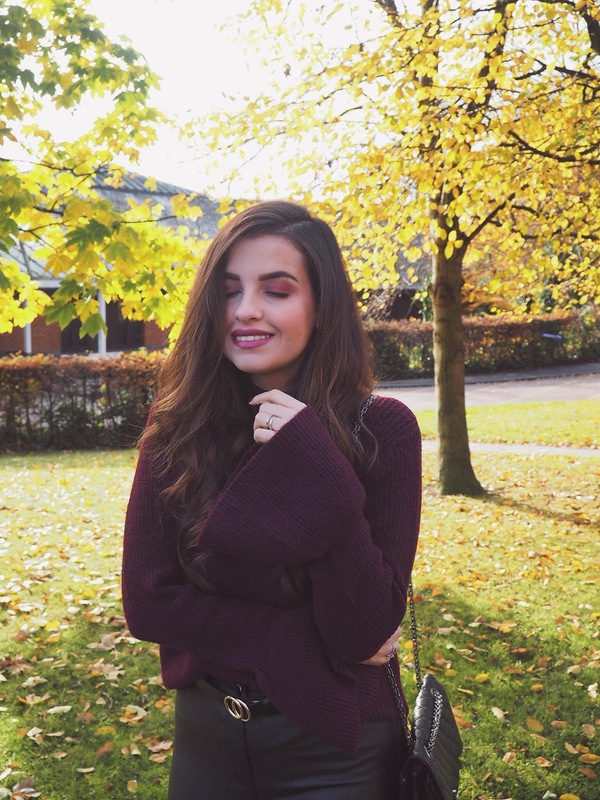 I know I have been featuring a lot of Primark pieces lately here on the blog, but what can I say, they are really hitting the nail on the head with their fall clothing, especially with their jumpers and their price tags! Gimme all your knitwear! I paired the jumper with jeans for a more casual Saturday night look, but for this shoot, I thought I'd pair it with these pleather pants and I like how sophisticated it all came together. This is an outfit I'd definitely wear again for date night or a night out. Pleather isn't the comfiest of materials, nor the warmest but dang, it sure looks good on! The Gucci belts sure have become very popular these past few seasons, but being the sensible person that I am I wasn't ready to spend over £250 on one. I'm not a big belt wearer, only adding them to very specific outfits so a Gucci belt just did not seem like a smart purchase. Instead, I set out to find an alternative on the high street and at first, I was going to purchase the River Island one (£12) many bloggers seem to love, but H&M did an even better deal and this beauty cost me a mere £4.99. I am going back for a small, as the medium does come up quite big and I've had to make extra holes myself (which never ends well). These boots are hands down the comfiest pair I own, from trusty Clarks! I've had these for quite some time now and have worn them non-stop over the years, and they look just as fabulous. Not only Clarks do great shoes, they seriously last and I am so glad that when I chose this I went for a timeless design in a stunning burgundy shade! Are you a massive fan of Burgundy too? What are your go-to colours for fall? Let me know below! Thanks for reading beauties! Gosto dessa cor. O look está giro! 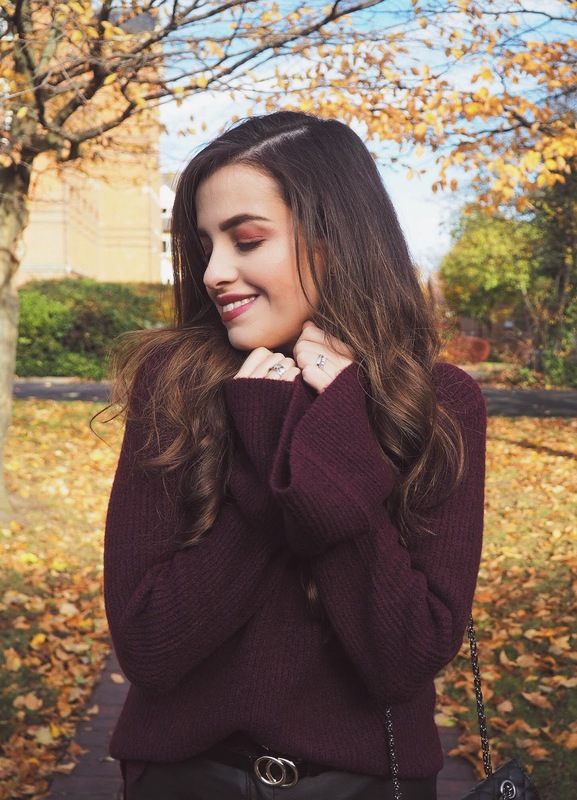 Burgundy looks great on you and I can't believe autumn is almost gone :( . Same here but winter brings the festive season, which I love! VOCÊ É MUITO LINDAAA! Esse look está perfeito! This color looks amazing on you! I love dressing for fall. Burgundy is such a beautiful color and it suits you a lot! You look so pretty in this. e esse look ficou lindinho demais, tão simples mas ao mesmo tempo os detalhes fazem tanta diferença! Rosto de Neve - Criei um preset lindo pra você deixar suas fotos ainda mais lindas! Vem ver! Great pictures, burgundy is one of my favourite colours this time of year! Me too, I can't imagine this seaon without Burgundy color. Love this look, the bell sleeve jumper looks amazing on you. Loving that jumper. You are finding some great items in Primark. I'l need to go and have a look. I love bell sleeve tops and this jumper is so gorgeous. 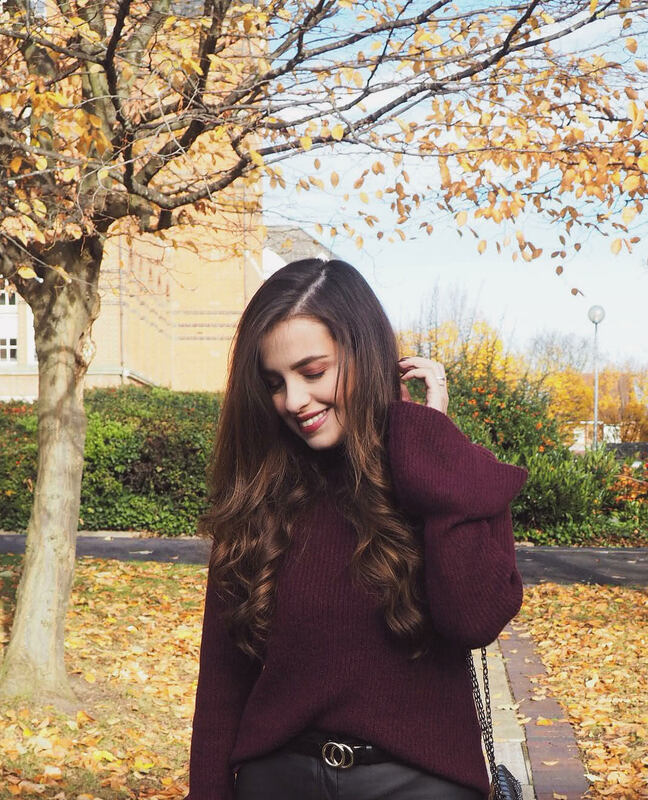 In love with that bell sleeve jumper <3 Such a beautiful burgundy outfit, Pam! You are gorgeous as usual! Burgundy is definitely my go to colour for Winter I can wear it everyday. I love burgundy, Pam! You look beautiful as usual! Loved the boots, the makeup is flawless, the double ring belt is really cool and the bell sleeved jumper is soo chic! The photos are really very beautiful! Hope you have a great day and week! Such an eternal color Mz Pam, love how you portrayed the color with this amazing selection and great looks, well done Mz Pam!! Such a beautiful sweater! I think that burgundy is your color! you know what, it might just be! I wasn't sure how bell sleeves would look on me but I am a fan of the trend now. Love the jumper on you, Pam! Such a cute look ! Love the color of your sweater, looks so comfy ! I'm seriously weak for monochromatic looks and you look amazing, babe! Btw, what eyeshadow are you wearing? It looks fantastic on you. I love wearing burgundy in the fall! The sweater and boots look like they were made to be paired together! 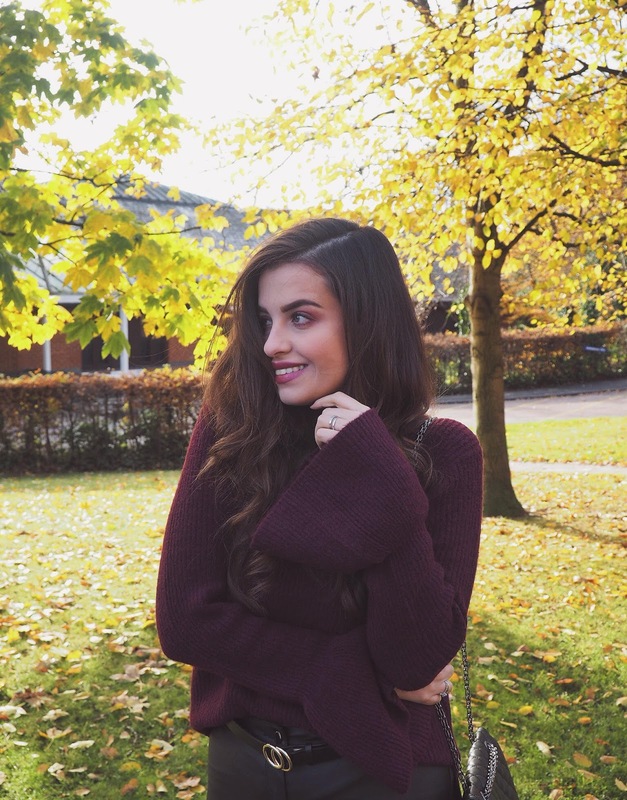 Burgundy is a beautiful colour for autumn and winter and it seems to be very much in fashion now! You look great! I just love this color even I have tunic with the same woolen stuff which I really admire. Just like every other girl, I love to collect nice and trendy clothes and recently I have brought some really nice Alysse Sterling Dresses which are very comfortable and at the same time best for any occasion. I must say, it's a worth buy product. Your sweater looks so warm and soft. I love this color especially on fall. I feel like Autumn is your season, you suit all the colours so well, especially burgundy. Love the jumper. So pretty on burgundy (that rhyme thou). Love that you paired it with the edgy pleather pants.